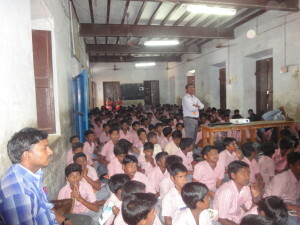 Rural Development Society, Kantharvakottai, Pudukottai Dist., is an NGO involved in rural development. 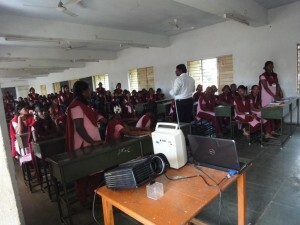 Sriram Charitable Trust donated computers & UPS to enable computer education of rural women and children. 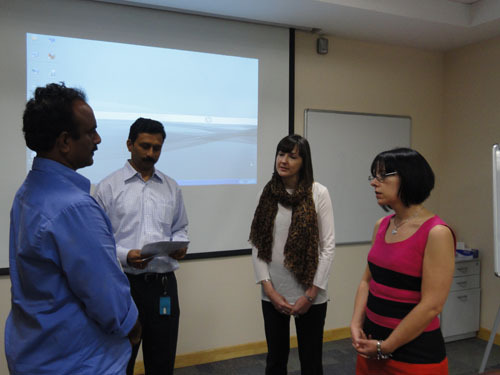 In this picture Dr. Muthuraman is receiving the donation from Ms. Carolyn Robson, Head of Content Services Operations, Cambridge University Press, U.K. in the presence of Ms. Nancy Roberts, Global Production Director, Academic and Professional Publishing, of the same Company. Also present in this picture is Mr. Sriram Subramanya, the Managing Trustee of the Sriram Charitable Trust (CSR Arm of Integra Software Services Pvt. Ltd.). 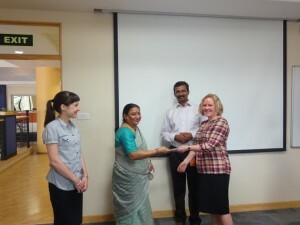 Ms. Deb Shor has handed over a cheque to Mrs. Kumuthini a board member of Sheva Padmasani Matriculation School for toilet construction. Training conducted by CII at Villupuram district on CSR (Corporate Social Responsibilities) activities.